Notice anything weird about the above graph of used car sales prices? In a survey of over 22 million used car sales at wholesale auctions, researchers found that purchase prices drop rather abruptly for every 10,000 miles on the odometer. Their analysis shows that a used car’s price does not smoothly decrease with higher mileage. Instead, buyers over-value cars until mileage hits a 10,000-mile marker, at which point bidding prices significantly drop. 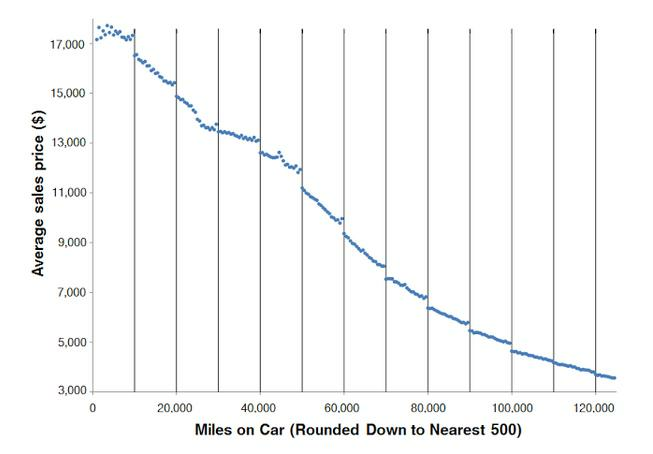 For example, a 79,900-mile car on average sold for $210 more than an 80,100-mile car, but only $10 less than a 79,800-mile car. The researchers attribute the mispricing to “left-digit bias”. Buyers try to simplify the information available to them by only focusing on what they deem most relevant. And this bias represents $2.4 billion worth of mispricing. So, sell your car when the odometer reads 49K miles, not 50K.